Cool photo of Moroccan wedding henna…note the uncommon use of solid half circles around the edge of the foot. Finally! A very happy announcement! We are very pleased to announce that “Moor: A Henna Atlas of Morocco” is now available for purchase! The first book of its kind, “Moor” is the story of henna in Morocco, giving you a first-hand account of how the Moroccans use henna for magic, beauty, and protection. After more than a decade of research, Lisa “Kenzi” Butterworth and Nic Tharpa Cartier are proud to present their findings in this groundbreaking book. “Moor” contains more than 40 pages of text covering the history and culture of henna in Morocco, as well as an in-depth design manual that gives step-by-step instructions for learning Moroccan design elements and creating authentic and beautiful Moroccan-style henna work. The book also features more than 20 full-color photos of Moroccan-style henna work, as well as over 100 pages of Moroccan henna patterns from traditional and modern sources. 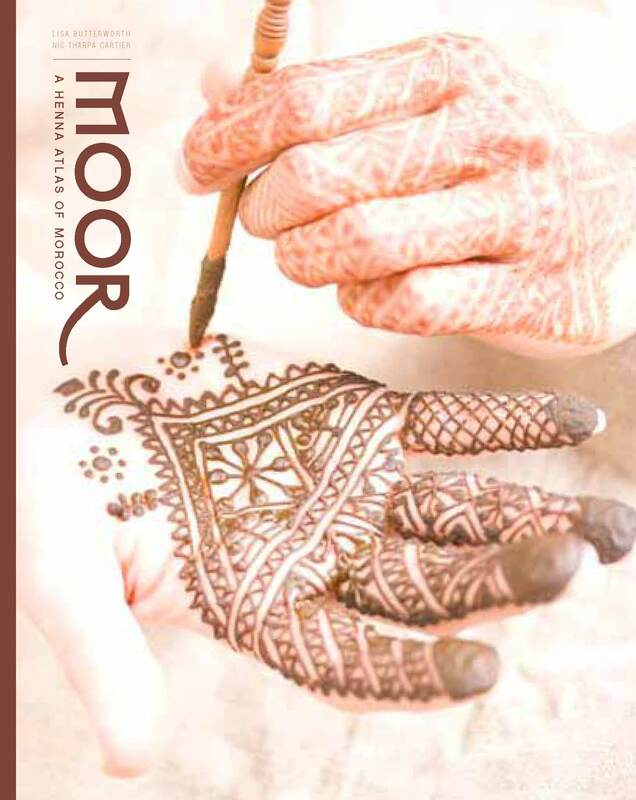 “Moor” is the first comprehensive manual covering all aspects of Moroccan henna, and will be invaluable to henna artists, fans of Moroccan culture, and anyone interested in the beauty and rituals of exotic lands. The book is currently available as a digital PDF download, for $43, from hennatribe.com at the following link: http://www.hennatribe.com/books.php or as a full color printed and bound copies through blurb.com at the cost of $52 for a softcover printing and $70 for a hardcover. B’saha! Wear henna in good health! I can’t believe I haven’t yet written about food in Morocco because it’s one of my favorite aspects of my time spent there (apart from henna, of course). With regard to food I was luckier than most casual travelers to Morocco who only experience restaurant food when eating in Morocco. I lived in Morocco for a year and a half and also visited every year for 13 years. I have visited all the big cities and explored every nook and cranny of them, and I have combed the countryside, looking for local markets, interesting sights, meeting extended family members and eating…a LOT! I have eaten in haute cuisine restaurants in elaborately decorated palaces, I have sipped tea with Polisario wives in their refugee camp tents, I have eaten tagine in desert truck stops, snacked on lung sandwiches in the old part of the capital Rabat and I have broken the Ramadan fast with tea and dates with my ex’s family. My food experiences are vast, interesting and mostly delicious. 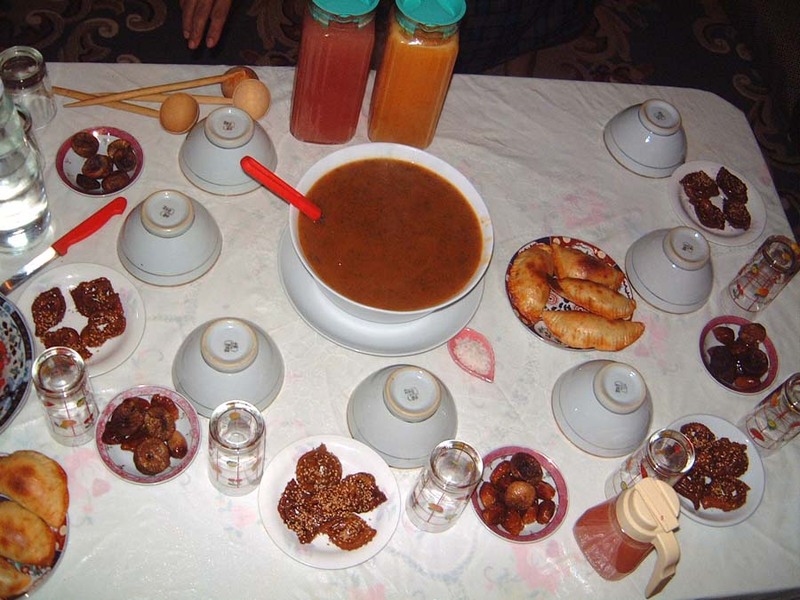 A typical Ramadan meal with harira and sweets. What prompted me to write is having recently seen a few blogs about Moroccan food which I found a bit ignorant misguided. One of these gave a recipe for the famous Moroccan dish “felafel” which isn’t even Moroccan. Another blogger wrote about the food she ate in Morocco and it was clear from her statement—that there wasn’t much variety in Moroccan food—that she had only eaten in tourist-oriented restaurants around Morocco. I feel it is incumbent upon me to set the record straight by giving you a taste of the variety of wonderful food in Morocco, from the haute to the low. This is a huge topic so I will start by giving you an overview, and then subsequent posts will go into greater detail; I might even post some of my favorite recipes. 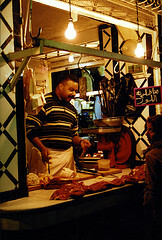 Most travelers to Morocco experience only restaurant food and don’t even realize how much they are missing by doing so. They can’t really be blamed for this because it’s logical to assume that when one is hungry and doesn’t have a kitchen, one goes to a restaurant. What most travelers don’t know is that average Moroccans don’t go out to eat in restaurants all that much and if they do, they don’t go out for Moroccan food. They go out for what they don’t cook at home, like French or Italian or sushi. They know that the best Moroccan food is cooked in the home, usually by one’s mother. From experience, I have to agree that anyone’s mother in Morocco cooks better than most restaurants. In the West we often go out to eat for special occasions but in Morocco special occasions are marked by extra attention paid to creating wonderful meals at home, cooking certain dishes that are only for celebrations. Going to a restaurant for a celebration is seen as a cheap and easy way out; whereas cooking something special at home shows that you really care. That said, sometimes you really cannot eat at home. A traveling salesman must eat his meals on the road, a post office employee can’t always run to her house to prepare a home-cooked meal. For these kinds of meals on the go and away from home there are a lot of places that offer quite good food. These places are usually off the radar for most tourists; they are found mostly where Moroccans work and live, not in tourist spots. Their appearance is decidedly not fancy and they rarely appear in guide books, but they are often some of the best places to eat. In all my traveling around the country one stand-by for food is the ubiquitous pairing of butcher shop and small restaurant. The idea is that you go to the butcher and pick out what you want. You can get ground meat mixed with herbs and spices for kefta kebab (like mini hamburgers on a stick), or just hunks of lamb (on a stick), or something the butcher recommends. The butcher will wrap up your choice, you pay for it and then carry it a few steps to the restaurant which has a charcoal fire burning. The restaurant will grill up your meat, serve it to you with fresh bread (possibly from the bakery next door on the other side), maybe some salad and a drink of your choice. It’s a simple meal but the ingredients are incredibly fresh, cooked in front of you and served with bread that was made within feet of where you are sitting. You can put the grilled meat in the bread and take it to go if you need to hit the road. Almost every town or widening of the road will have a stand like this. When you travel by bus around Morocco the driver will stop at a gas station/truck stop that has one of these stands. In larger cities, such stands can be found everywhere each one offering its specialty. It was in such a place that I tried lung sandwich, but only a taste. I opted for a chicken sandwich which strangely enough was made with chicken still on the bones. And the fries are served stuffed into your sandwich, an effort at gustatory efficiency which I applaud. It is also possible to find more elaborate stands that make tagine, a kind of stew that is prepared in a many different regional varieties across the country. The stew is named for the cone-shaped earthenware pot in which it is prepared. I have a bunch of recipes here which will give you an idea of what goes into the dish and how it is prepared. The pot is put onto a charcoal brazier and cooked for a few hours; these stands usually have the tagines cooking out in front. You can stop by and ask to see what they have cooking and pick what you like. Again, you take a seat in the restaurant and the waiter will bring you bread (with which you eat the tagine), some salads and drinks. This option is a bit more expensive than the grilled meat stand, but it is also more of a complete meal. In addition to the above, there are always stands selling specialties like steamed snails, lamb and lentil soup (harira), fruit smoothies, dried nuts, bread, sweet, fruit etc. Because Morocco is such an agriculturally rich and varied country, the food is all excellent and very fresh. I’ve eaten an lowly, quotidien orange in Morocco that blew my socks off; I never knew an orange could be so delicious. I was told that these were the reject oranges, the leftovers after they export the best quality oranges to Europe. That ruined me for oranges evermore. That brings us to the discussion of staples of Moroccan cuisine. Protein comes from chicken (#1 most consumed meat in Morocco), beef, lamb and fish. European fishermen vie for the right to fish in Moroccan waters, specifically the Atlantic coast. In seaside towns there is usually an area near the port where you can buy fish directly from the fishermen and have it grilled right there, similar to the grilled meat places described above. With fish that fresh you don’t have to do much but grill it and squirt a little lemon on it. Moroccan food is said to be spicy. I would agree with that in the sense that they use a lot of spices, but it is not usually hot spicy. The most common spices/flavorings are cumin, saffron, turmeric, ginger, garlic coriander, pepper and cayenne pepper. There is a liberal use of olives and olive oil, lemon, mint, tomatoes, onions, peppers and parsley. Common fruits are oranges, figs, dates, pomegranates, apples and apricots. Sweets are often made with almonds or walnuts, mixed with honey and rosewater. Bread is a very important staple, served with practically every meal, and never wasted. When bread goes stale it isn’t thrown away, but instead ground into a sand-like meal from which tea biscuits are made. Couscous, a fine-grained pasta made from semolina, is another staple which is the basis of the national dish of Morocco of the same name. Needless to say the marketplaces in Morocco are dazzlingly colorful, highly fragrant and mouth-watering.